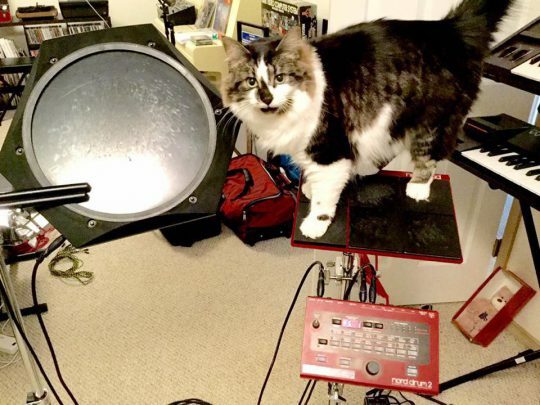 Our friend Dahlia returns, this time atop a Nord Drum 2. We also see sundry electronic percussion, keyboards and more. From Rob Robinson on Facebook. Dahlia poses atop a Moog Sub 37 synthesizer. In the back we see some classic Roland instruments, three Roland Boutique synthesizers, and more. Dahlia’s photo comes to us via our friend Rob Robinson. You can read more about his music here.